M/V Lady Rosalind I from an elevation, by Scott Vardy at Marine Traffic.com. 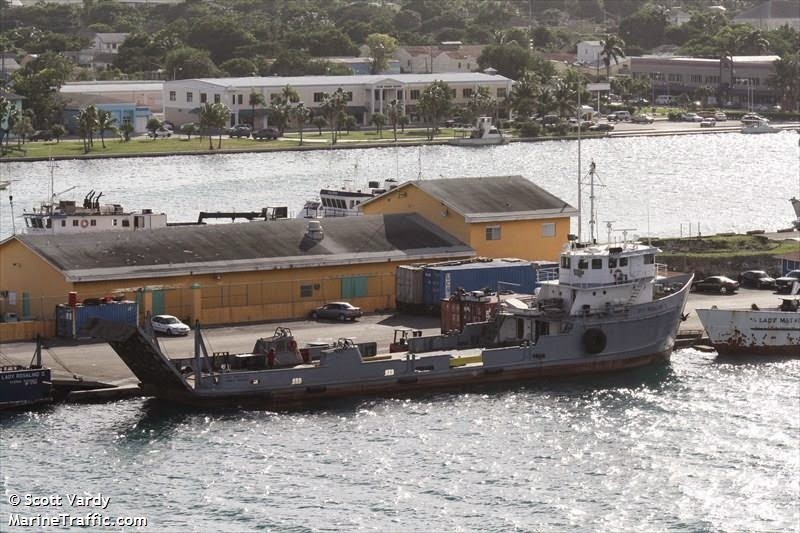 BAHAMAS CAREER: said to serve North Andros, was photographed at Potter’s Cay Dock March 2014 and March 2015, at which point she was serving as Substitute Boat for other vessels. The Taylor brothers purchased her from owners in Texas, according to Capt. Eddins Taylor in an interview April 2015. NOTES: As of June 2010 the IMO database at www.equasis.org lists this boat as “no longer updated”. She appears to be still operational as of March 2014 and the author had a conversation with Capt. Gifford Johnson who suggested that Capt. V. H. Black may be the captain. M/V OMS Maverick, a previous name to M/V Rosalind I built 1967, as per Capt. Eddins Taylor. Photo courtesy of Capt. Eddins Taylor, Taylor Corporation, it hangs in their dock-side trailer. I’ve always heard my island friends tell tales of all the out island travel, and have always been inquisitive, and somewhat jealous of their adventures. I’ve visited the Exumas, Bimini, Abaco, and Eleuthera, but the family islands had eluded me thus far. This past summer, I finally was invited to join the fun… Bahamian style. My boyfriend, who himself is a Bahamian Boat Captain, took me along on his adventure. He never misses an opportunity to rally at a regatta, homecoming or any other excuse for partying in the out islands. Our original intention was to fly to Inagua for the Family Reunion for August Monday. After booking 4 seats on the Bahamasair Flight, we were told 3 days prior to our departure that we no longer had seats on the flight, and would be getting our money back. Bahamasair is known for their bad business practices and nepotism, so please… if at all possible – Do not depend on this airline if you can help it. We changed our plans and decided to head to Cat Island via the mail boat, Lady Rosalind, for the Cat Island Regatta. I arrive in Nassau on Thursday morning… ready to be whisked off to this private paradise. We’ll in true Bahamian style; the mail boat was not readied on Thursday, and would not leave until late evening the following day. This really didn’t bother me, since I have friends on the island and was anxious to say hello and hang out a bit. The wait did get a bit tedious, when we were told that the cars would board at 3pm. We waited until 8:30 pm and we still weren’t boarded and our car would not be on the boat due to lack of space. I had never asked the inevitable question, just how long is this trip? Well, the answer is… 14 hours or so, depending on the weather. Oh well. Let’s roll with the punches. Let’s get this party started. Our adventure started on a wonderful note. We left the dock and headed east directly into the rising moon. The vision of the endless black sea against the deep blue sky with millions of stars so bright and vibrant was the most exhilarating and inebriating sight I have seen in quite some time. I stared for hours as the moon rose into the sky and the eastern star shown brightly as we sailed off into the night. On board the boat, there was little room. 140 people and 32 cars were crammed onto the mail boat… A single “head” was in working order (at least for the first few hours). After sipping rum and cokes, and tapping a few beers with some friends, the hour had come to relax and settle in for the long trip. The time did not pass quickly, but alas, morning finally broke through and we were at our landing in Smith’s Bay on Cat Island. A small inlet with a very rustic docking area. A quick trip into the brush… for relief from the evenings drinking, and we were off on our adventure. We were “camping” on the boat for the duration of the trip, so I was on the hunt for a decent place to wash up, and maybe even change my clothes. The boat was pretty disgusting by this point, I wasn’t about to try to wash or change onboard. My friend had made arrangements with some local friends for me to use their facilities and clean up each day. However, they were not usually available when I needed them, so we made due with nature. A bottle of fresh water, soap and a toothbrush came with me to the beach each morning, as I washed, soaked, soothed my aching muscles and changed into fresh clothes. The heat of the day took its toll on us by noon. We commandeered a car, turned on the air-conditioning and went off to visit friends and family. The island was filled with family reunions and parties. The folks we met, stop after stop, were the most congenial, pleasant people I’ve ever met. The island is stunningly beautiful, but obviously poor and underdeveloped. We were fed like family everywhere we went. After meeting a dozen or two family members, we were off to Old Bight, to check out the regatta. (Note: no boats showed up, because the promoters forgot to book the mail boat to carry them). The small settlement town had 2 or three buildings that constitute a town, of which one was the local bar/club. The ½ mile stretch of road off the beach was lined with stalls with Bahamian food and drink, domino tables, authentic Bahamian goods, and more alcohol than I’ve ever seen. The band, who are good friends of ours, play for the next 2 days, and they entertain for hours on end as people dance on the dance floor, on the beach and in the streets. The party doesn’t end. We made it back to the boat somehow that night, and then back to Old Bight by midday the next day to continue the party. Now, let me tell you, I am not a youngster. This is not usually my style of vacation, but being in this place, with these people was the most fun and adventure I’d had in a long time. I couldn’t care less that my hair was washed in salt water, or that I changed my clothes on the beach. Now, I know that there are resorts, cottages, homes and villages to relax and enjoy the sun. We drove past a few as we examined the island. I will definitely visit this island again. The beaches are the most pristine and alluring I have seen in the Caribbean. The sand like white talcum powder. The peace and tranquility cannot be surpassed, the people most endearing. After 3 days we sadly boarded the Lady Rosalind for our journey home. Once again, we watched the pure blue skies and white clouds as we passed pods of dolphins and flying fish follow us home. This was indeed an adventure. I recommend it to those who are open minded and don’t mind getting a little “dirt under you nails”. Lady Rosalind I at Potter’s Cay Dock c/o frtrfred.